My job is a "Staff Biologist" which is a cool way of saying I'm an Animal Keeper. I work at the Point Defiance Zoo & Aquarium located in Tacoma Washington USA. 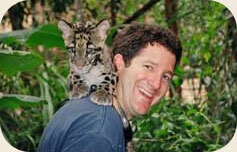 I also work from time to time in Thailand at the Khao Kheow Open Zoo, on a clouded leopard project. Why do you care about helping clouded leopards? Have you ever seen one? They are an incredible cat. I have worked with cats my whole career and the first time I was around a clouded leopard I was hooked. They are like little tigers that can climb trees and fly through the air, they're amazing. This is a top predator and if we can save this animal it will save many others that don't get as much attention. I got my start a long time ago, won't say how long, while I was in college I volunteered at a local zoo. I had always planned on working with animals and this was a great opportunity to get experience. What is the best part of my job you ask? I have become so good with a rake and shovel... ok joking, come on its being with or around animals all day long and teaching people about them. As a keeper you get to see things that these animals do that most people will never see. What suggestions could you give me for getting into your field? I'm not telling, then you'll be after my job. Alright here is what you need to do. Go to school and get a degree in an animal related field, Zoology, Biology or Animal Science. While you're working hard to get those good grades volunteer at a zoo or try to get some kind of animal experience. If you get a lucky break and get into the zoo world be patient - so many people want to be training animals right away. It doesn't work that way; you've got to get some experience under your belt. If you work hard you'll get there. Do you think clouded leopards have a chance to survive in the wild? Tough question but I have to say yes. As I'm writing this I'm in Thailand working with the clouded leopards. We have built a display that allows park guest to see us interacting with the cats while a keeper stands out front and talks to the visitors. They love it and the interest people have in what is happening to this amazing animal is overwhelming. Teaching the local people how to save this animal is the only way to save them. Getting them to care about the cat and then giving them educational material on what they can do is the key. So yes they are going to make it, but we still have a lot of work to do. How can I help clouded leopards? Well it always comes down to money and that is the truth. The different projects for these cats cost money to run. But that doesn't mean you have to shell out your own money. Have a garage sale for leopards, bake sale or what ever idea you can think up. I know kids that have put together events and then given the proceeds to the "Clouded Leopard Project". Ok let's say that's not enough for you. Get into it! Become someone who is determined to make a difference. Get that degree get out in the field with the teams who are working the hardest to save this cat. You can do it if you really want to. Copyright 2003-2011. The Clouded Leopard Project. All Rights Reserved. Original site design by elephants & ants.